We install the next day ! IMPROVE YOUR SECURITY WHEREVER YOU ARE! Designed by Nortek, the Personal Emergency Response System (PERS) “numera LIBRIS” combines many technologies to ensure your protection. The device’s sensors make it one of the most efficient and accurate fall detectors on the market. Balance problems because of their physical condition or their age. Side effects following their medication. The PERS numera LIBRIS +, with access to the powerful application EverThere. 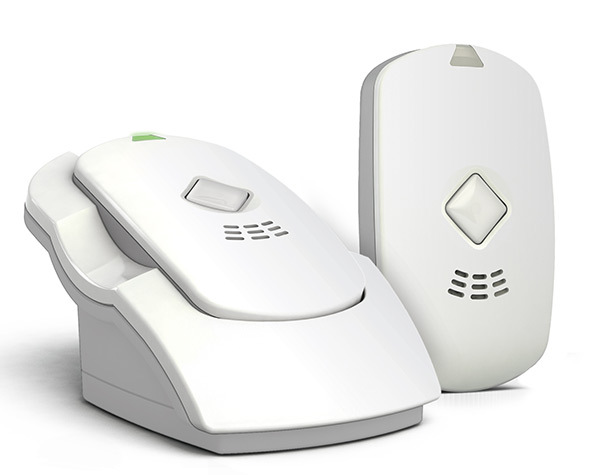 Multiple accelerometers calculate and differentiate the speed of falls and of your movements. A magnetometer measures the direction and strength of the magnetic field around it. A gyroscope detects abnormal rotations. More than 190 parameters are evaluated by these devices to ensure that there is no false alarm. If the PERS determines that a fall has occurred, it sends these records through the cellular network for further analysis. A complex algorithm will establish the cause of the data and contact an emergency trained agent if there is a real fall. This entire process takes only between 30 and 45 seconds. WHAT IS THE EVERTHERE SOFTWARE? Manage your health information and who will receive this data. A very short delay between the incident and the two-way call with a specialized agent. The advanced location of your emergency bracelet. As well as the recording of your medical data to facilitate the follow-up to your caregivers. Personalize the rights of the people you want to share your health information with. Check the signal’s strength at all time, the battery level of your device and change the volume of the voice warnings. Decide who will receive the information of your weight, your level of oxygenation and your blood pressure. This platform is designed for everyone and will alert your team of healers using SMS or email. Depending on the type of emergency, change the alerts. Contact the specialized agents directly through your PERS numera LIBRIS. Global Security offers this sophisticated Personal Emergency Response System right now! To discover how the numera Libris pendant can protect you and at what price, contact us today! TO GET A QUOTE OR ASK A QUESTION, WRITE US. WE WILL BE HAPPY TO ANSWER YOU. Global Security is a Canadian leader in home security and helps protect thousands of homes and businesses in Canada by being the nation’s most important authorized ADT dealer since 2001.